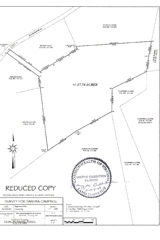 ABSOLUTE REAL ESTATE AUCTION 375+/- AC | GAINES DICKENSON AUCTIONEERS, INC. ABSOLUTE REAL ESTATE AUCTION 375+/- AC – GAINES DICKENSON AUCTIONEERS, INC. Tracts 1, 2, & 3 have been platted for location purposes only, a copy of which is the second image. Tract 4 current survey is the first image. TRACT 4-CONTAINING 17.74 +/- ACRE TRACT BEING SOLD BY CURRENT SURVEY IS NOT CONTIGUOUS WITH TRACTS 1, 2, OR 3. JOINS RT 613 MOCCASIN ROAD. ABSOLUTE AUCTION WILL BE CONDUCTED OFF SITE AT THE OAK GROVE COMMUNITY CENTER (RT 613) IMMEDIATELY FOLLOWING THE SPECIAL COMMISSIONER’S SALE OF 270+/- ACRES SCHEDULED FOR 11:00 A.M.
PROPERTY SELLS AT ABSOLUTE AUCTION REGARDLESS OF PRICE. A THREE PERCENT (3%) BUYERS PREMIUM WILL BE ADDED TO THE FINAL BID TO DETERMINE FINAL CONTRACT SALE PRICE. A TEN PERCENT (10%) ESCROW DEPOSIT OF FINAL CONTRACT SALE PRICE IS REQUIRED AT CONCLUSION OF AUCTION BY CASH OR CHECK WITH PROPER I.D. BALANCE UPON DELIVERY OF DEED ON OR BEFORE FRIDAY, APRIL 10, 2009 (NO EXCEPTIONS). FROM HIGHWAY 58 AT BOLTON, TAKE RT 613 (MOCCASIN VALLEY RD) 2/10’S MILE, TURN LEFT ONTO RT 677 (CEDAR GROVE RD, PROCEED 7/10’S MILE, TURN RIGHT ONTO RT 676 (CLINCH MTN RD) PROCEED APPROXIMATELY ONE MILE TO SUBJECT PROPERTY. 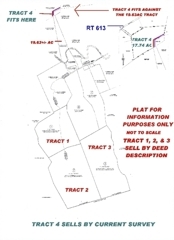 TRACTS 1, 2, & 3 SELL BY DEED DESCRIPTION, TRACT 4 SELLS BY CURRENT SURVEY. TRACTS 1, 2, & 3 LOCATED OFF RT 676 AND TRACT 4 ADJOINS RT 613. 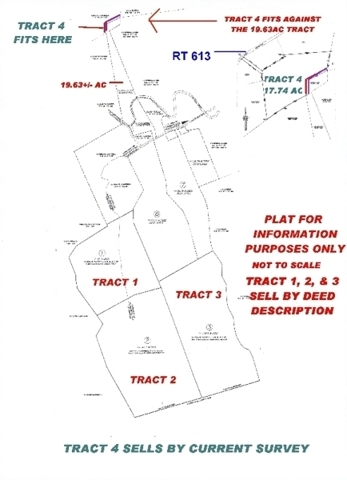 TRACT 4 IS NOT CONTIGUOUS WITH TRACTS 1, 2, & 3.